Authentic, charming three stars hotel, housed in a former seventeenth century convent, which has preserved its beautiful decor, patina and stonework through out the centuries. Our 28 rooms are soundproofed and air conditioned. Nestled in the heart of the historic Marais district, which has become one of the liveliest areas of Paris, the Saint Paul Le Marais Hotel welcomes you to a warm atmosphere and offers a true haven of peace that will contrast nicely with the bustling busy streets. A rich and varied high quality buffet, is served daily from 7:15 a.m. to 10:00 p.m. (until 11:00 a.m. on Sunday) in our vaulted dining room. On sunny days, and if time allows, it can be served in our courtyard. Throughout your stay, the hotel offers a lounge and a bar where you can have a drink. In summer, it is also possible to relax or enjoy a drink in our courtyard, a charming patch of greenery in Paris. Keep in touch with your friends! Free WIFI throughout the hotel, and if you do not have your computer, enjoy our Web corner near the reception, also free (plus free printing)! Newspapers and magazines are also available. The Picasso and Carnavalet museums, the picturesque "St Paul Village", Sainte Catherine Marketplace, the Hotel de Ville, and the Notre Dame Cathedral of Paris are only a few minutes’ walk away, just waiting to be discovered. You will no doubt enjoy the many art galleries, fashion boutiques, famous restaurants and typically Parisian bars. Begun in 1605 under the reign of Henry IV, the construction of this square, located where the ancient palace of Catherine de Medici once stood, was completed in 1612. It is famous for its symmetry and order of the facades that border it. These are indeed identical but the houses that lie behind them are not in any way! And if you wish to visit one of them, it is possible since the one located in the southwest corner was occupied by Victor Hugo and is now a museum dedicated to him. So enjoy your visit! In front of the Notre-Dame of Paris is where the Kilometre Zero of Paris is located. For those who don’t know, this marker represents the exact point from which all distances are calculated in relation to the capital. To find it, stand in the middle of the square, about 25 meters in front of the cathedral’s main entrance. A golden disc embedded in the ground marks the spot. It is also a good viewing point to admire the cathedral’s newly restored Gothic facade. Heading to the flower market, you can see engraved on the ground the streets that existed before Baron Haussmann made sweeping changes to the city’s layout… remains of medieval Paris. This flower market has been set up on this site for almost two centuries. Open from Monday to Sunday from 8 am to 7:30 pm, it offers all kinds of plants, from the simplest to the most exotic (including the famous carnivorous plants). On Sunday it has also become a bird market. This is the hotspot for children and bird & plant-lovers alike. This is perhaps the oldest location in Paris, in the heart of the Ile de la Cité. This is where the kings of France established their first royal palace, later to become the Conciergerie because it housed the "Concierge" (the equivalent of the current mayor of Paris). Today there stands the Sainte Chapelle, often considered the jewel of Gothic art. It is said that the crown of Christ is preserved within it. After serving as a prison during the years after the Revolution, the Conciergerie became a museum which receives visitors daily. The Place du Châtelet is named after a small ancient castle that guarded this part of the Seine from attacks coming from the river. It did not resist the modernization of Paris initiated by Napoleon in 1802, and the engravings that remain bear witness to the historical loss that its destruction represents. A fountain now stands in the centre of its original location and on the sides are two theaters built by Davioud between 1860 and 1862, on the orders of Baron Hausmann. The one located to the east is the City Theatre, formerly known as the Sarah Bernhardt Theatre, where you can now visit the dressing room of this successful actress who found fame on its stage. This tower looks very bizarre standing alone in the middle of its surrounding park. But this has not always been the case: it was a tower from the Church of Saint-Jacques-de-la-Boucherie built in the early fifteenth century and destroyed after the Revolution. The tower had a strange use in the early nineteenth century when a worker used it to make bullets by dropping molten lead from the top of it into a small tub of water placed at its base. This church gets its name from Meredicus, the abbot of Saint-Martin who was chosen as the head of the right bank of the Seine in 884. The current building was constructed during the first half of the 16th century in the Gothic style following the model of Notre Dame. Today, Saint-Merri aims to be a musical parish regularly giving free concerts. Post old Paris, this Centre is one of the most famous expressions of Paris from the late 20th century. This huge building, built on the initiative of President Georges Pompidou, is the home of contemporary art. From the restaurant’s panoramic terrace is an amazing view of the city rooftops. This street, whose existence can be traced back to 1232, takes its name from the Convent of the Brothers of the Holy Cross. It was located right at the current site of the Holy Cross of Bretonnerie Square. It was destroyed after the "moral laxity" of the monks in the 18th century. Today it is the centre of the gay community in Paris. This is one of the few monasteries kept in good condition in the centre of Paris. Walking around this Gothic style cloister, you will find paving stones differing in colour to the rest. Do not be surprised, this cloister is the resting place of one of its Father Abbots. It is said that in 1290, a poor woman could not repay the Jewish usurer Jonathan. He offered her the possibility of erasing her debt in exchange for a consecrated host. When she brought it to him, he stabbed her and she began to bleed. He threw her into boiling water and the pot began to overflow with blood. Once his crime was discovered, Jonathan was burned alive. His property was handed over to Philippe le Bel, who built an expiatory chapel on the site of the house. Adjacent to the famous Mount of Piety, the church of the White Friars (monks wearing a white coat) moved here in 1258 from St. Louis. 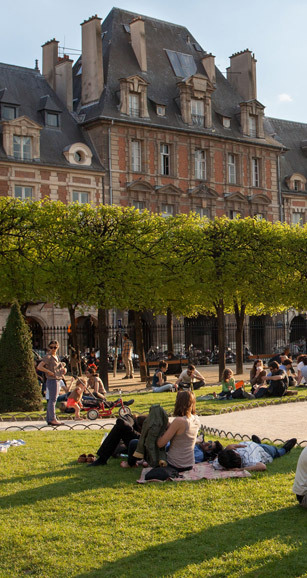 It offers visitors of the Marais a welcome haven of rest from its busy shopping area. In the past this street was used a shooting ground for crossbowmen, hence its name. Its originality comes mainly from the fact that it has retained the medieval appearance it had when John the Fearless had his cousin and rival, Louis of Orléans (the king’s brother), murdered there: an act that was to revive the Hundred Years’ War. The rue des Rosiers is the most well-known street of the Jewish Marais area. Here you can discover just about everything that characterises the Jewish culture: synagogue, specialised book stores but above all food shops such as the famous chain ‘Chez Marianne’ and Goldenberg’s butcher shop. This is where you are most likely to bump into Jews in traditional dress complete with kippas and sidecurls. On your strolls around the area you will spot a number of commemorative plaques recalling the persecution of the Jews during the 1940s. The Hôtel de Lamoignon, now home to the historic library of the city of Paris, is one of the oldest hotels in the Marais. It was built for Diane de France in 1585. She died there at the age of 81, after having known seven kings of France. Her son, Charles of Valois, died in 1650 and his wife, Françoise de Nargonne, outlived him by 63 years. She died in 1713, 139 years after her father in law, King Charles IX! The City of Paris purchased this Renaissance style hotel in 1880 as the site for its historical museum. In the centre of its gardens stands a famous pedestrian statue of Louis XIV. Today the Hôtel Carnavalet is a museum open from 10 am to 6pm every day of the week expect Mondays and bank holidays. It is free to visit.